San Francisco is known for nature, museums, nightlife, shopping, and childrens museums. 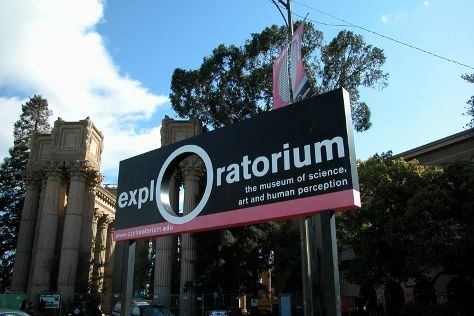 Your plan includes some of its best attractions: snap pictures at Golden Gate Bridge, take a leisurely stroll along Fisherman's Wharf, get a taste of the local shopping with Ferry Building Marketplace, and engage your brain at California Academy of Sciences. To see photos, reviews, where to stay, and other tourist information, go to the San Francisco vacation maker . Perth, Australia to San Francisco is an approximately 25-hour flight. Traveling from Perth to San Francisco, you'll gain 16 hours due to the time zone difference. In July, San Francisco is a bit warmer than Perth - with highs of 26°C and lows of 16°C. Finish your sightseeing early on the 29th (Wed) to allow enough time to travel to Bakersfield. Bakersfield is a city in California, United States, and the county seat of Kern County. Kick off your visit on the 29th (Wed): take an in-depth tour of Kern County Museum, meet the residents at California Area Living Museum (CALM), and then explore and take pictures at Murray Family Farms. To see ratings, more things to do, where to stay, and more tourist information, use the Bakersfield road trip planner . Use the Route module to find suitable travel options from San Francisco to Bakersfield. When traveling from San Francisco in July, plan for much hotter days in Bakersfield, with highs around 44°C, while nights are somewhat warmer with lows around 27°C. Finish your sightseeing early on the 30th (Thu) so you can travel to Las Vegas. On the 30th (Thu), have some family-friendly fun at Dig This, then get your game on at Sin City Smash, and then indulge in some culinary diversions at a local gastronomic tour. Here are some ideas for day two: get some thrills out on the water with a waterskiing or jet-skiing adventure. To find more things to do, where to stay, and other tourist information, you can read our Las Vegas trip planner. Drive from Bakersfield to Las Vegas in 4.5 hours. Alternatively, you can fly. Plan for somewhat warmer nights when traveling from Bakersfield in July since evenings lows in Las Vegas dip to 32°C. Wrap up your sightseeing on the 1st (Sat) to allow time to travel to Grand Canyon National Park. On the 1st (Sat), hike along Bright Angel Trail. Get ready for a full day of sightseeing on the 2nd (Sun): explore the stunning scenery at Grand Canyon South Rim, admire all the interesting features of East Rim Drive, and then take some stellar pictures from Lipan Point. To see photos, other places to visit, reviews, and tourist information, go to the Grand Canyon National Park road trip site . Getting from Las Vegas to Grand Canyon National Park by combination of car and flight takes about 4.5 hours. Other options: drive; or take a shuttle. Traveling from Las Vegas to Grand Canyon National Park, you'll lose 1 hour due to the time zone difference. In August, Grand Canyon National Park is much colder than Las Vegas - with highs of 31°C and lows of 11°C. Finish your sightseeing early on the 3rd (Mon) so you can travel to Farmington. Farmington ' is a city in San Juan County in the US state of New Mexico. Kick off your visit on the 3rd (Mon): explore the activities along Animas River. Get ready for a full day of sightseeing on the 4th (Tue): explore the ancient world of Cliff Palace and then admire the majestic nature at Bisti/De-Na-Zin Wilderness. To find reviews, maps, more things to do, and tourist information, go to the Farmington planning tool . Traveling by car from Grand Canyon National Park to Farmington takes 5 hours. Alternatively, you can fly. Prepare for a bit warmer weather when traveling from Grand Canyon National Park in August: high temperatures in Farmington hover around 36°C and lows are around 17°C. Wrap up your sightseeing on the 4th (Tue) early enough to travel to Alamosa. Alamosa is a city under Home Rule Municipality that is the county seat and the most populous municipality of Alamosa County, Colorado, United States. On the 5th (Wed), see the interesting displays at The San Luis Valley Museum and then indulge your thirst for a good beer at San Luis Valley Brewing Company. To find ratings, more things to do, and more tourist information, read our Alamosa journey maker website . Getting from Farmington to Alamosa by car takes about 4 hours. Expect slightly colder temperatures when traveling from Farmington in August; daily highs in Alamosa reach 31°C and lows reach 8°C. Wrap up your sightseeing by early afternoon on the 5th (Wed) to allow time for travel to Dumas. Dumas is a city in Moore County, Texas, United States. For other places to visit, traveler tips, maps, and more tourist information, go to the Dumas trip planner. Getting from Alamosa to Dumas by car takes about 5 hours. Other options: fly. Due to the time zone difference, you'll lose 1 hour traveling from Alamosa to Dumas. In August, Dumas is somewhat warmer than Alamosa - with highs of 36°C and lows of 19°C. You will leave for Oklahoma City on the 6th (Thu). Here are some ideas for day two: get your game on at iFLY Indoor Skydiving - Oklahoma City, look for all kinds of wild species at Martin Park Nature Center, and then examine the collection at American Banjo Museum. For reviews, more things to do, maps, and tourist information, refer to the Oklahoma City trip itinerary planner . Traveling by car from Dumas to Oklahoma City takes 4.5 hours. Alternatively, you can fly. Traveling from Dumas in August, you can expect nighttime temperatures to be somewhat warmer in Oklahoma City, with lows of 24°C. Finish your sightseeing early on the 9th (Sun) so you can travel to Shreveport. Shreveport is the third-largest city in the state of Louisiana and the 113th-largest city in the United States. Start off your visit on the 9th (Sun): explore the world behind art at R. W. Norton Art Gallery and then try to win big at Harrah's Louisiana Downs. Get ready for a full day of sightseeing on the next day: try to win big at Margaritaville Resort Casino, then browse the different shops at Louisiana Boardwalk, and then try your luck at Horseshoe Casino. To find where to stay, traveler tips, and more tourist information, refer to the Shreveport day trip website . Drive from Oklahoma City to Shreveport in 6 hours. Alternatively, you can fly. In August, daily temperatures in Shreveport can reach 39°C, while at night they dip to 27°C. Wrap up your sightseeing on the 10th (Mon) early enough to travel to New Orleans. You'll explore the less-touristy side of things at Garden District and Clue Carre - New Orleans' First Live Escape Game. Step out of New Orleans with an excursion to Whitney Plantation in Wallace--about 54 minutes away. There's still lots to do: contemplate in the serene atmosphere at St. Louis Cathedral, take in the local highlights with Walking tours, pause for some photo ops at Deepwater Horizon Memorial, and brush up on your knowledge of spirits at Old New Orleans Rum Distillery. To find where to stay, reviews, ratings, and tourist information, read our New Orleans day trip tool . Traveling by car from Shreveport to New Orleans takes 5 hours. Alternatively, you can fly. Traveling from Shreveport in August, expect nights in New Orleans to be somewhat warmer, around 32°C, while days are a bit cooler, around 32°C. Cap off your sightseeing on the 14th (Fri) early enough to travel to Chattanooga. For more things to do, ratings, and tourist information, you can read our Chattanooga day trip app . Traveling by flight from New Orleans to Chattanooga takes 5.5 hours. Alternatively, you can do a combination of flight and shuttle; or drive. The time zone changes from Central Standard Time (CST) to Eastern Standard Time (EST), which is usually a 1 hour difference. When traveling from New Orleans in August, plan for a bit warmer days in Chattanooga, with highs around 37°C, while nights are slightly colder with lows around 24°C. Cap off your sightseeing on the 15th (Sat) early enough to travel to Charleston. Charleston is the capital and the largest city in the U.S. Kick off your visit on the 15th (Sat): browse the eclectic array of goods at Capitol Market and then get a sense of history and politics at West Virginia State Capitol. For more things to do, reviews, and more tourist information, refer to the Charleston sightseeing planning website . Do a combination of bus and flight from Chattanooga to Charleston in 5 hours. Alternatively, you can fly; or drive. Traveling from Chattanooga in August, things will get little chillier in Charleston: highs are around 34°C and lows about 20°C. Wrap up your sightseeing on the 17th (Mon) to allow time to travel to Salamanca. Start off your visit on the 17th (Mon): look for gifts at Watson's Chocolates and then trek along Holiday Valley. To see traveler tips, maps, other places to visit, and other tourist information, use the Salamanca trip planner . Traveling by car from Charleston to Salamanca takes 6.5 hours. Alternatively, you can fly. Expect a bit cooler temperatures when traveling from Charleston in August; daily highs in Salamanca reach 26°C and lows reach 15°C. Wrap up your sightseeing on the 18th (Tue) early enough to travel to Schenectady. Schenectady is a city in Schenectady County, New York, United States, of which it is the county seat. Kick off your visit on the 18th (Tue): Head underground at Secret Caverns and then Head underground at Howe Caverns. On the next day, admire the majestic nature at Saratoga Spa State Park, stop by Saratoga Olive Oil Company, and then try your luck at Saratoga Race Course. For photos, ratings, maps, and more tourist information, read Schenectady online trip builder . Traveling by car from Salamanca to Schenectady takes 5 hours. Alternatively, you can fly. Prepare for somewhat warmer weather when traveling from Salamanca in August: high temperatures in Schenectady hover around 30°C and lows are around 21°C. Finish your sightseeing early on the 20th (Thu) so you can travel to Boston. You'll explore the less-touristy side of things at Dolphin & Whale Watching and Race Point Beach. Explore Boston's surroundings by going to Stoneface Brewing (in Newington), Cape Neddick Nubble Lighthouse (in York) and Provincetown (Provincetown Library & Pilgrim Monument & Provincetown Museum). The adventure continues: enjoy the sand and surf at Ogunquit Beach, explore the world behind art at Museum of Fine Arts, take in the architecture and atmosphere at Old North Church & Historic Site, and admire all the interesting features of Fenway Park. For traveler tips, where to stay, reviews, and other tourist information, refer to the Boston trip itinerary planner . Traveling by car from Schenectady to Boston takes 3 hours. August in Boston sees daily highs of 32°C and lows of 21°C at night. Wrap up your sightseeing on the 24th (Mon) early enough to travel to New York City. Explore hidden gems such as Walkway Over the Hudson State Historic Park and Sam's Point Preserve. Get out of town with these interesting New York City side-trips: Franklin D. Roosevelt Presidential Library and Museum (in Hyde Park), Adams Fairacre Farms (in Wappingers Falls) and Dutchess Rail Trail (in Hopewell Junction). There's lots more to do: don't miss a visit to Central Park, hunt for treasures at Chelsea Market, and tour the pleasant surroundings at 8th Ave Jetty. For other places to visit and tourist information, use the New York City vacation planning app . Traveling by combination of flight and bus from Boston to New York City takes 3 hours. Alternatively, you can fly; or drive. Traveling from Boston in August, plan for a bit warmer nights in New York City, with lows around 25°C. Wrap up your sightseeing by early afternoon on the 27th (Thu) to allow enough time to travel back home.